Enjoy the tranqulity of one of the oldest farms in the Overberg, Nach Wacht Farm is a renovated old shed which can sleep 6. No need to self-cater, the stunning Country Cuisine (www.arnistonweddings.co.za) is located on the premises. Only 8 km from Bredasdorp and 12 km from beautiful Arniston. 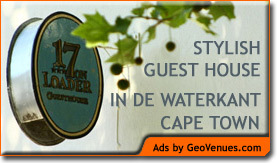 For guest house accommodation in Cape Town – stay at 17 on Loader Street, in de Waterkant Village.